He works in his studio full time alongside a small team of assistants who help him sort and clean the wood, weld the steel frames and generally assist where and whenever they are needed. His largest public work to date is a series of 3 galloping life size thoroughbreds that are now racing through the Flower Dome of Gardens by the Bay in Singapore. So far Doran-Webb has created two masterpiece dragons, ‘The Wyvern in the Baobabs’ and ‘Wyvern’s Folly’. The 46-year-old craftsman spent several weeks creating this giant beast. The wood he uses to sculpt animals is easily about fifty years old, collected at the beaches and rivers around Cebu.. This enormous Wyvern Dragon is made out of thousands of pieces of driftwood recovered from the shore by James Doran-Webb. 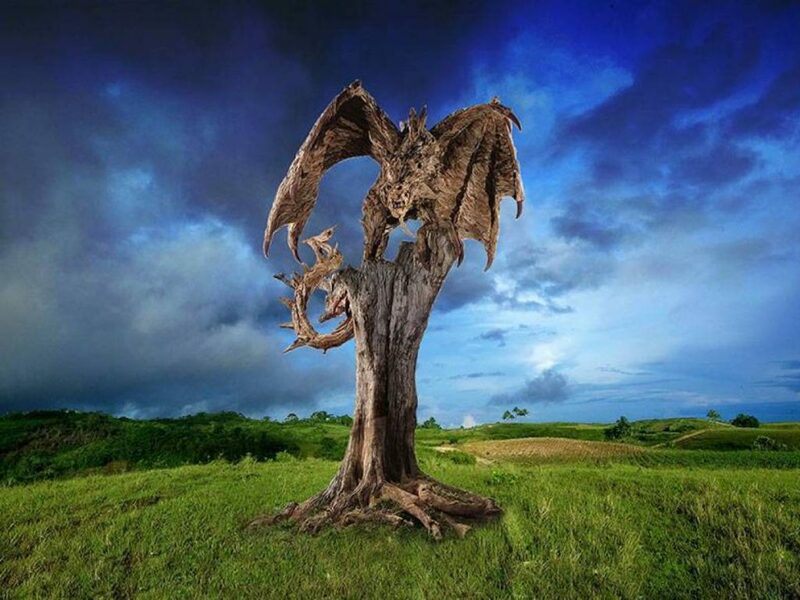 The Wyvern in the Baobabs, perched on a long dead tree, is so huge that it required Doran-Webb to expand the studio. It also required a huge metal frame so it wouldn’t fall.